He attended: St Aidans Community College. 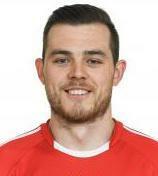 Position: Defender He first started playing hurling out in front of his house with his Father. Biggest influence on his hurling career has being both of his parents, they've both done everything possible for him and supported him all the way along with his club Na Piarsaigh. The sporting event he would most like to attend is a Conor McGregor UFC fight in Vegas. To date his favourite moment in sport has being winning the Senior Munster Hurling Championship in Pairc Ui Chaoimh in 2014. Favourite Venue: Pairc Ui Chaoimh. Favourite G.A.A. player: Sean Og & John Gardiner, his 2 heroes growing up and he was lucky enough to play alongside them for many years with his club. The sportsperson he would most like to meet is Roger Federer, the man is a genius. The hardest part of his sporting life is getting up early every morning. Toughest player to mark in training is Seamus Harnedy, it turns out the nice guy act is in fact only an act!! Well able to dish it out!! The joker on the panel is Lorcan Mcloughlin! You don't want to get caught on the end of this fellas jokes!! If he won the lotto the first thing he would buy is a Private Jet. Favourite holiday destination: Dubai. Favourite Food: The Mothers Chicken Curry. Favourite Drink: Fanta Orange. Favourite Music: Macklemore. Favourite Film: Forest Gump. In ten years time he hope to be: Happily retired flying across the world on his Private Jet after winning the Lotto One thing you may not know about himâ€¦â€¦He is the only man in the world to have beaten Patrick Horgan in the Glen Ball Alley!!! !